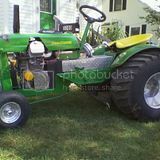 This is our S/S tractor. Posted a few pics of this before but we have made some changes. Had some hiccups this season and finally got it right. Any video of it pulling? This is a couple seasons ago. I will get one of it now. Its got ALOT better heads on it now and will turn upper 9k leaving the line. This is 7500-8k. This was this afternoon. Winning the open class. Had a little too high of a gear but the big Vogel roller cam builds a ton of torque and hauled it out the end. WOW!! THATS COOL DENNIS! REAL NICE! do you still pull the single cylinder? Last pull of the season resulted in a munched transmission. So a trans overhaul and upgrade resulted in a completely new tractor. Rebuilt the chassis from scratch. 56 inch wheelbase, dropped spindles, new front frame section, rebuilt clutch, new hood, new hood stays, new paint, new dash. I built the dash from scratch. I built the front frame and spindles. New three speed setup in gear box with hardened topshaft, forks, billet pinion bearing support. New hood from Amstutz pulling. When the trans gave up it stripped all the teeth from the second gear cluster gear and counter shaft gear. Also broke a tooth from the ring and pinion. Slid engine forward 6 inches. Very nice Dennis. It is a clean looking machine! Tyler Cromwell - Cromwell Racing Engines - Specializing in Briggs Vanguard and Kohler Command V-twin engines, and Honda/Clone singles from mild to wild! Built to win, Engineered to last. -Cromwell Racing engines and parts are home to numerous national championship titles and fastest qualifying times. VERY NICE! IS THAT AN OLD JD 140? Same tractor in the older photos John. I just redid it for my oleman. It belongs to him I just build the chassis and the engine for him. Its all cub cadet except for the hood and hood stays. HMMM... LOOKED LIKE AN OLD 140. I DIDNT KNOW A CUB COULD LOOK THAT GOOD. Ok here is a new video from a couple Fridays ago. A bunch of new parts since last post. The previous engine ran well but just not enough to run with 50.5 tractors. So it went under the knife. Now it has a new reverse ground Hackman cam, head swap, MWSC new cast aluminum intake for stock heads, new center exit header, all new fuel system. New front wheels and new hood wrap. It now will turn an honest 10,000 rpm. Has midwests new tech tach on it with recall. this video was a 25 tooth gear over 8000rpm at the end of the pull. Still running race fuel. Had to up grade the pushrods to 3/8 .080 wall with 5/16 ends. Comp Cams springs, ultra pro mag rockers, jesel push rods, comp cams solid roller light weight lifters. It runs now. VERY NICE AND 8000 RPMS. WOW. THAT WILL GET YOUR BLOOD PUMPING. A video a friend put together. This is the old engine. Old trans. Havent gotten to pull much with the new setup. Looks and sounds awesome . THAT IS COOL! BEAUTIFUL MACHINE! LOOKS LIKE A LOT OF FUN TOO!